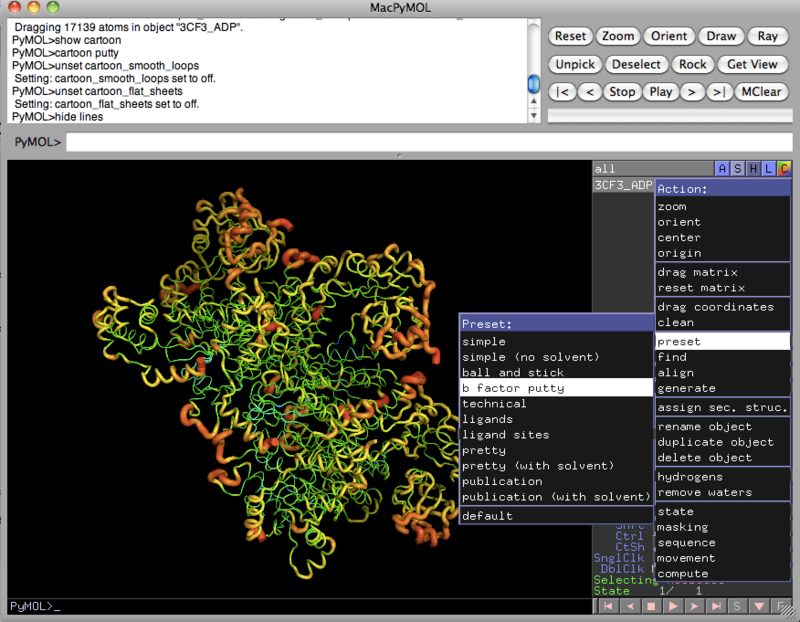 If you want to see the “b-factor putty” view where the backbone is displayed as a tube with a diameter correlated to the b-factor of the structure, simply click the Action button of the object (the “A” button); mouse to “preset”; and select “b-factor putty.” The structure will automatically convert to a colored putty view suitable for slide figures or publications. 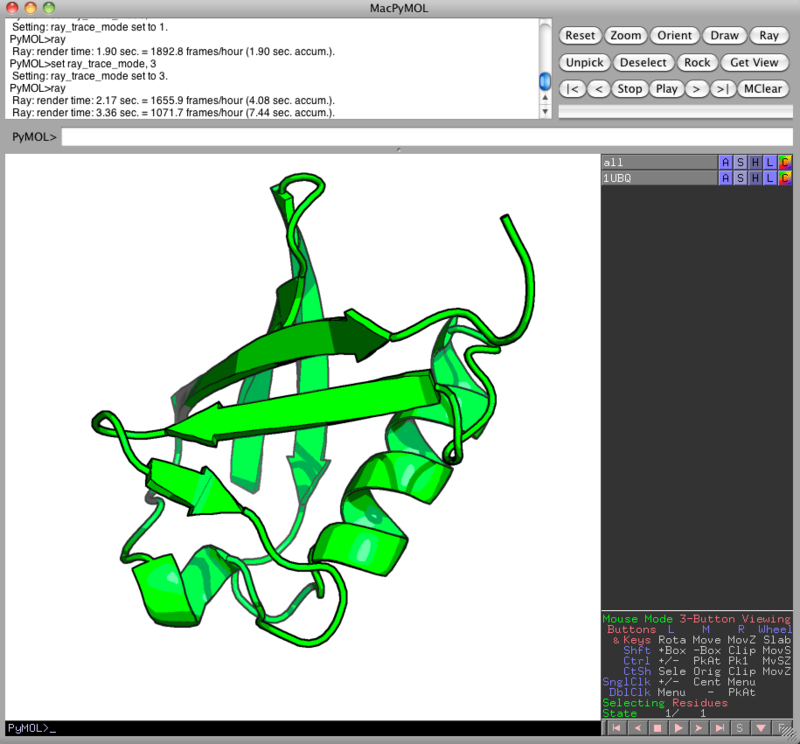 Create B-factor putty in PyMOL. Be sure to heed (or, more typically, ignore) the warning about how the results are qualitative and not quantitative. And then proceed to enjoy the lovely patches of negative and positive potential rendered on the surface of your protein of interest. Keep in mind that as in point #2, the SASA calculation in PyMOL is an estimate. For very accurate calculation, use a dedicated SASA solver. This tip is a lot of fun, because it lets you see your molecules as if they had been drawn in a pen-and-ink manner, like a real cartoon. This is sometimes useful for presentations or other less-formal venues where you want to clearly illustrate something about your molecular structure. Finally, the last tip is extremely simple. If you and your colleagues are sitting around looking at a molecule structure, sometimes it helps to view it from different angles. Instead of twiddling the mouse back and forth, you can simply click the “rock” button at the top right of the PyMOL window to start the scene panning gently from side-to-side to aid visualization. Please feel free to post any other useful PyMOL tricks and tips in the comments below. 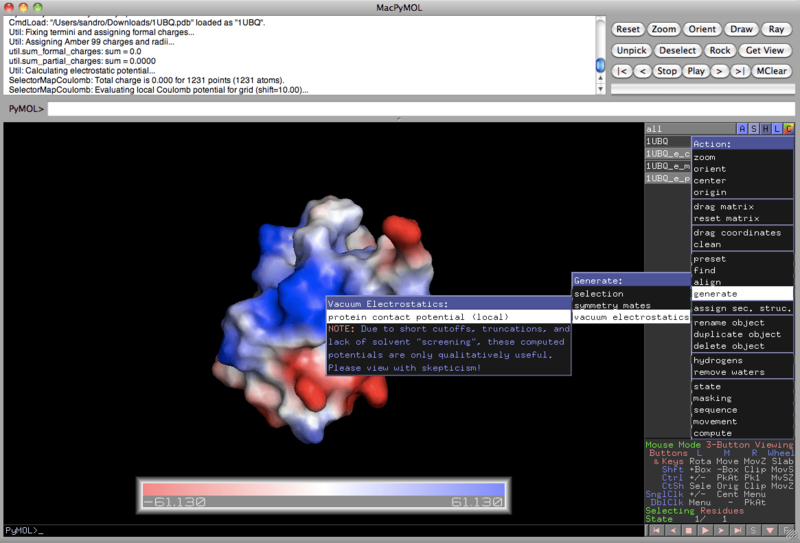 Note: I am running PyMOL 1.3 Incentive on a Mac OS X 10.6.8 system.